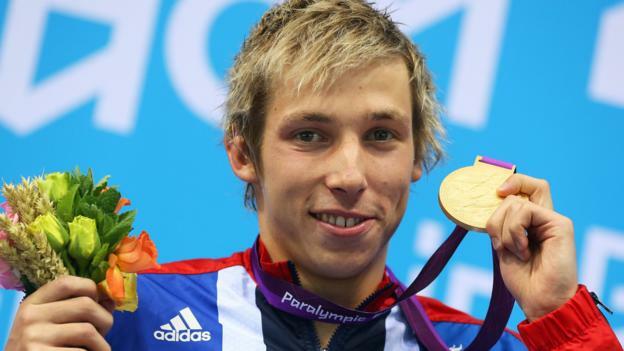 Paralympic gold medallist Jonathan Fox says he was left fighting for his life in the weeks leading to a type 1 diabetes diagnosis. Fox, 27, who won gold at London 2012 and has now retired from swimming, initially attributed his symptoms to stress after a “shock” reclassification saw him moved to a more difficult racing category in March. “At one point I couldn’t talk, I couldn’t walk and they (Salford Royal staff) literally saved my life,” Fox told BBC Sport. In a wide-ranging interview the 100m backstroke world record holder, who has cerebral palsy, explains how he’s combating a fear of needles by self-administering insulin injections and discusses the “devastating” impact reclassification has had on his life. Fox felt “on top of the world” at the beginning of 2018, but just months later he was withdrawing himself from the England Commonwealth Games squad with ‘stress’ after being moved from the S7 to S8 category. The swimmer hoped to redeem himself at the European Championships in August, but failed to qualify at the trials two months earlier – which diabetes potentially played a role in. “Looking back now, all of the signs were there,” he said. “I was doing sets in training that would usually be easy, but I was feeling exhausted and I was awful. He lost two stone during a holiday in July and just as the Europeans in Dublin began – Fox was being rushed to hospital by his “lifesaver” girlfriend Megan. “I’d been unable to keep even water down for days, but my urine was clear so I thought I must be hydrated,” said Fox, who weighed just 60kg – 12kg less than when racing – at his point of entry to hospital. “It turned out I was literally urinating pure sugar and the doctors told me I had more than seven times the amount of sugar in my blood that a normal person does. Fox is also full of praise for the staff at Salford Royal, without whom he admits he “may not be here” now. “I’m glad they caught it when they did because if the classification had been fine earlier in the year then I’d have been at the Europeans when this happened,” said the four-time Paralympic medallist. Fox’s biggest fear though – aside from being somewhat nervous about hospital visits – concerns needles, but they are now part of his everyday life. “I have a real phobia about needles, but I have to inject myself before every meal with insulin now, which is difficult,” says the former swimmer. Despite his condition Fox is adamant he would have continued racing through to the Tokyo 2020 Paralympics were it not for the reclassification. “I know others have carried on competing with diabetes and the doctors, as well the support staff at British Swimming, said I could continue too,” said Fox. “Tokyo would have been my fourth Paralympics which would have been an amazing achievement, but it’s not like it used to be. He was one of five British swimmers moved to different categories following re-testing by the International Paralympic Committee (IPC) as part of their bid to improve the fairness of disability sports competitions across the world. A BBC investigation earlier this month revealed that an Australian Paralympian had been accused of ‘exaggerating her symptoms’ while Baroness Tanni Grey-Thompson stated last year some athletes have been warned about voicing their concerns around Para sport classifications. Although devastated by his own reclassification Fox holds no grudge or ill-feeling towards those who carried out the testing and believes it is “crucial” for the sport’s progress. “I respect the process and I’m a fair and honest person who gave it their all during the tests,” Fox told BBC Sport. The Cornwall-born swimmer, who moved to Manchester in 2011, unsurprisingly sees his S7 100m backstroke victory at London 2012 as his major career highlight. “I remember diving into the finish and could hear the 18,000 people cheering even though my head was under the water – it was just an amazing feeling,” reflects Fox, who was GB’s first gold medallist at the London Aquatics Centre. “Moments like that and the two silvers in Rio after shoulder surgery the year before show how important swimming has been my life and I wanted to finish on my terms by not having retirement forced upon me. “Going forward I’d love to stay in aquatics and think I have a lot to give back at a grassroots level but also with the podium squad as I believe people do respect what I’ve achieved.